We’re so excited for the new trailer for the upcoming 5th season of the Netflix series Schitt’s Creek. In case you haven’t been watching the show (and you really should be), the series follows the Rose family, a formerly wealthy family (video store magnate Johnny and soap opera star wife Moira) who find they’re almost broke after an employee embezzles their money. The only asset they are left with turns out to be ownership of a small town, named Schitt’s Creek, Johnny bought years ago as a joke. The Roses are forced to relocate to the small town with their two spoiled children, daughter Alexis and uber-gay son David, leaving their pampered, wealthy lives behind. 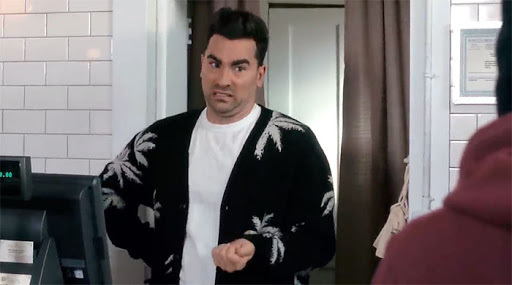 Eugene Levy and Catherine O’Hara star as the parents, and Levy’s real-life son Dan Levy co-created the series and plays David alongside Annie Murphy’s Alexis. Speaking to the Toronto Star, Dan (who’s openly gay) shared that the fan base for the series is very wide ranging - from seniors to teens, from Democrats to Republicans. In fact, he says “some of the most touching feedback” has come from conservative, religious viewers who’ve never “understood” the LGBTQ community. He also celebrates the creative freedom he and the show’s creative staff has enjoyed in exploring gay storylines. “As a gay person to tell these stories and to have no questions asked and no notes from network and to feel completely uninhibited in saying, ‘This is a gay couple on TV; they’re going to kiss like any straight couple would” — it’s amazing. 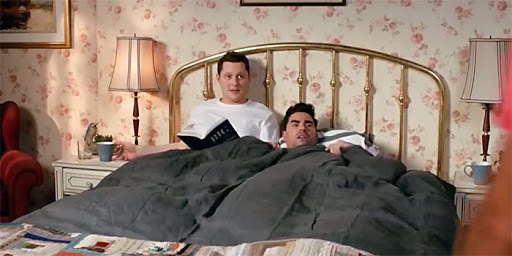 Calling the show’s 4th season a “midpoint,” Levy feels the series has a “whole half a football field to go” in exploring Schitt’s Creek’s characters. Season 5 of Schitt's Creek drops on Netflix January 16. Watch the trailer below.